Robert Jaeger | Econsult Solutions, Inc.
Mr. Robert S Jaeger has over three decades of Executive Experience in the Hospitality Industry. His experience spans from working for the Loews Corporation, Warwick International Hotels, Hilton Hotels, and Ramada. Jaeger has experience as a Hotel Industry Consultant working on various projects in New York, Philadelphia, California, Florida as well as the Caribbean. He has worked on projects from concept to feasibility to budgets and worked on construction cost analysis and budgets. In the last 18 years Jaeger has served as Vice President and General Manager of V & H Hotel Associates with overall responsibility for the Best Western Center City Hotel in Philadelphia Pa. Jaeger has worked in New York City, Stamford Ct, Princeton NJ, Washington DC, Philadelphia Pennsylvania and has Managed Diverse Hotels ranging from 183 rooms to 600 rooms. Jaeger’s professional experience is complimented by his participation in Philadelphia’s Hospitality Industry. He currently serves on the Executive Committee of the Board of the Philadelphia Convention and Visitors Bureau (PHLCVB) and Executive Committee of the Board of the Greater Philadelphia Hotel Association (GPHA). Jaeger served as a member of the Hospitality Initiatives Committee of Greater Philadelphia Tourism Marketing Committee ( Visit Philadelphia ) for 14 years and as the past Vice Chairman and Officer of PHLCVB as well as Officer of GPHA. Jaeger is a member of Philadelphia Board of Realtors and is a Real Estate licensed Sales Person. 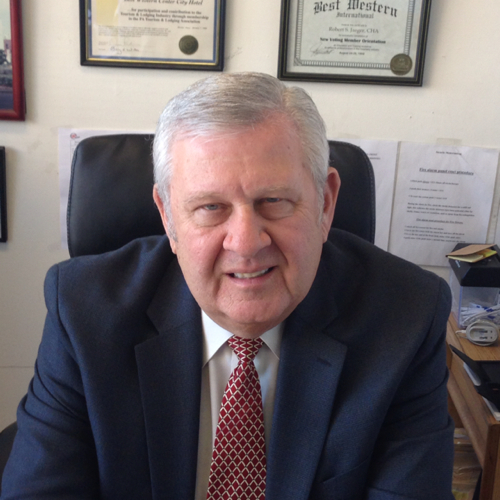 Mr. Jaeger is a Certified Hotel Administration from the American Hotel and Lodging Educational Institute, a Certified Realtor for the Commonwealth of Pennsylvania. He also holds a degree from Brooklyn College.